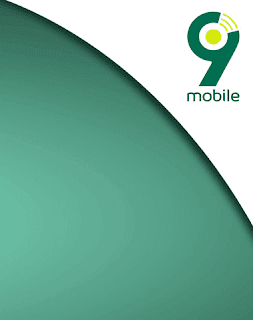 Below are the updated 9mobile call tariff plans and their migration codes to help you choose the best one that is convenient and affordable for you. Recharge of 200naira, get you 300naira valid for 7 days to call five 9mobile numbers on your You & Me list. Recharge 100naira and get 100naira weekly for 7 days. You get 10MB data each week, with weekly recharges of 100naira only. Option for "Receiver pays" on your behalf when you make calls without sufficient airtime. Call rate is 40kb/sec but can get as low as 25kb/sec when you use 25naira or above daily. 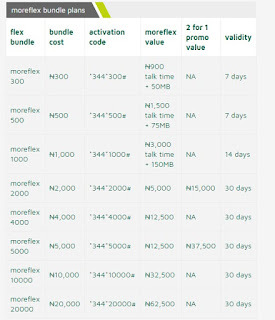 Call rate for 9mobile Morecliq to Morecliq drops to as low as 15kb/s when use 25naira daily, 20kb/sec to 9mobile lines on different trarrif and 30kb/sec to other networks in Nigeria. Recharges of at least 200naira gives Free 15MB of data each week. Call rate is 20kb/sec to 9mobile network and 40kb/sec to other networks. 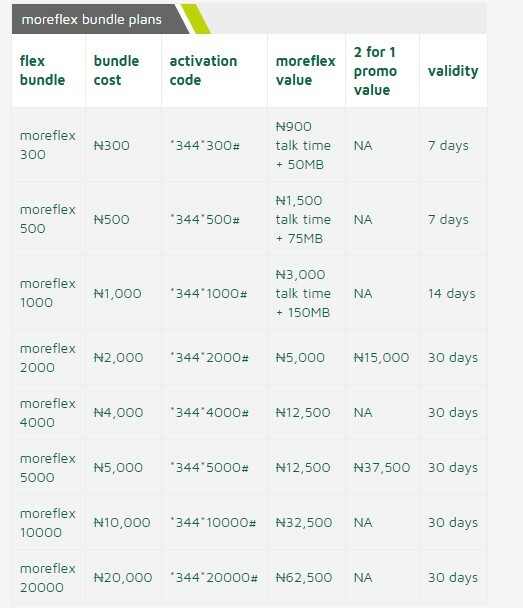 You can activate or migrate to 9Mobile Morecliq by dialling *244*1# and enjoy! 300% bonus When you purchase flex of 4000, 10,000 and 20,000. When you purchase flex of 300, 500 and 1000, you get more than 300% reward. And also, when you purchase flex of 2000 and 5000, you get 150% reward. You get a third bundle free when you purchase the same flex bundle of 2000 and 5000 sequentially. Call rate of 40kb/sec and N4 on each SMS. However, this may vary on different bundles. Recharges of N5000 or more in a month, enjoy free incoming calls while roaming on selected networks in 6 nations. UK (vodafone), US (T-mobile), South Africa (vodacom), UAE (9mobile), Netherlands (KPN) also, Saudi Arabia (mobily). Service is valid for 30 days. To exit from all packages, dial *344*0# . Calls to all networks at 15kb/sec including a daily charge of N5. Calls to 7 nations (UK, USA, China, Canada, India, Germany and Malaysia) at rate of 15kb/sec. SMS is charged at N4 per SMS. Enjoy free incoming calls while roaming on 14 networks in the nation (USA (T-mobile), Uk (Vodafone), UAE (Etisalat), South Africa (Vodacom), Spain (Vodafone), Ghana (Vodafone), Kenya (Safaricom), France (Orange), Saudi Arabia (Mobily), Morocco (IAM), Netherlands (T-mobile), Germany (T-mobile), Turkey (Turkcell), and Egypt (Vodafone).) when you recharge 5000naira or more in a month. Meanwhile, service valid for 30 days. Check your Morelife balance by dialling *232# or affirm the bundle by dialling *244*3#. 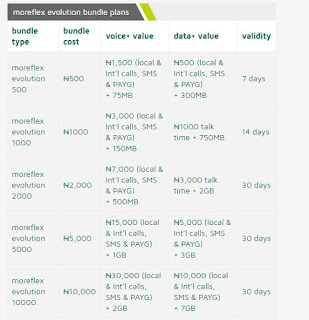 Purchase Moreflex evolution of 500, 1000, 5000 and 10,000 voice plans, you get 300% reward. Meanwhile, you'll get more than 300% when you purchase 2000 voice+. Purchase flex evolution 10,000 data, and get up to 7GB of data. Recharges of 5,000 or more a month gives free incoming calls in 14 nations, which are: USA (T-mobile), Uk (Vodafone), UAE (Etisalat), South Africa (Vodacom), Spain (Vodafone), Ghana (Vodafone), Kenya (Safaricom), France (Orange), Saudi Arabia (Mobily), Morocco (IAM), Netherlands (T-mobile), Germany (T-mobile), Turkey (Turkcell), and Egypt (Vodafone). Meanwhile, service valid for 30 days period. Dial *320# to activate and *232# to check balance and to exit all Moreflex evolution packages, dial *300*0# and enjoy! Get 80% off on calls to other 9mobile networks at the rate of 12kb/sec. Make calls at rate of 12kb/sec from 12:30am till 4:30am each day. You can subscribe or activate this plan by dialling *244*8#. Gives 250% bonus on every recharge, for new cliqlite users which can be used to call all networks. Get 100% data monthly bonus on purchases from 100MB to 10GB to browse 5 educational and 2 social websites. Calls rate is 40kb/sec but when you spend N25 daily, you'd get 20kb/s for cliqlite bonus, other 9mobile network for 25kb/s and other networks at 30kb/s. 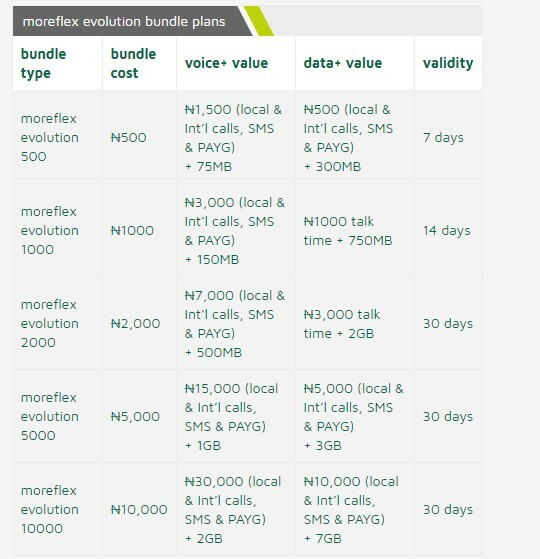 These are the current List of 9mobile call tariff plans 2017 for you to select or migrate to any plan you want and also give you the best bonuses for calls and data.